Tenleytown’s past, present, and future is on display at the library. Discover local history and view creations by some of tomorrow’s brightest artists and performers from local schools. Art lovers of all ages can also take part in interactive crafts and henna art. Anita Seline presents Janney Days, a nearly 100-year history of Janney Elementary’s role in the development of Tenleytown and its critical place in the community. First published in 2001, the Janney PTA recently re-published the school’s history, with Seline adding a chapter on the school’s expansion years. Copies of the book will be available. National Presbyterian School proudly celebrates 50 years in Tenleytown! View historic photographs from the school’s early years, as well as original art and images of NPS students’ annual Tenleytown study. Kids create their own car to take to the drive-in. 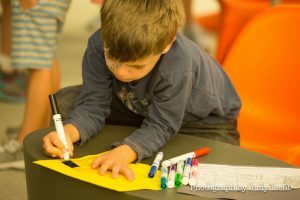 Using cardboard, crayons, markers, and more, Tenleytown’s youngest engineers create the cars of the future which they’ll “drive” into the children’s room for a special screening of Pixar movie shorts. Art becomes personal with free henna tattoos – not to worry, these tattoos are only temporary.